LOS ANGELES (AP) _ Back on the court for six days and heading into his first tournament in two months, Andre Agassi is beginning a comeback he hopes will carry him into next month's U.S. Open. "I've got a long road ahead of me, but I'm certainly in a position to look forward,'' said Agassi, playing this week for the first time since losing in the first round of the French Open in May. Sidelined by a lower back injury that hampered him at Roland Garros, the 35-year-old Agassi had to miss Wimbledon for the second consecutive year. He planned to begin playing again last week in Indianapolis, but pulled out because it was taking him longer than expected to recover. He opens play Tuesday night as the No. 1 seed in the Mercedes-Benz Cup. He faces unseeded Jean-Rene Lisnard. "It's been a difficult eight weeks because the process of getting better was slower than anticipated,'' Agassi said Monday. "It was pretty bad after Paris. Agassi, whose eight Grand Slam titles include two U.S. Open championships, has an inflamed nerve in his lower back. He has taken a a series of cortisone injections, which help some. "The part of it that is difficult is that it being a nerve, you don't know when it's coming,'' Agassi said. "I don't get my hopes up, I just take it week by week. Agassi apparently doesn't plan to retire anytime soon. 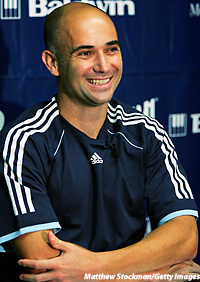 Agassi is going for his fourth championship in the Los Angeles tournament. "Coming off eight weeks of not playing, I can't think of a better place,'' he said. "I have played so well here and used it as a springboard into my season.